John Flood's Random Academic Thoughts (RATs): Robert Rosen and "Lawyers in Corporate Decisionmaking"
Robert Rosen and "Lawyers in Corporate Decisionmaking"
The recognized study of the disparate roles that corporate attorneys play in representing and advising their institutional clients. Long passed around and cited by scholars and lawyers as an unpublished manuscript, the book is also accessible to a wide audience and includes inside interviews. Professor Robert Rosen insightfully explores the choices that lawyers, managers and executives make about how lawyers are involved in corporate processes. 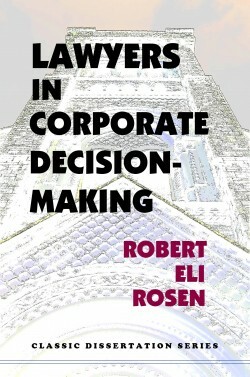 In the companies studied, Rosen showed that corporate lawyers were repeatedly intertwined in decisions—beyond those regarding mere legal compliance—ranging from finance to production to sales to returns to litigation. But the how, when and consequences of their involvements varied. The book analyzes these variations. It examines relations between inside and outside counsel and the management of the corporate legal function. It locates them in a taut framework of organization theory and institutional behavior, a frame and application since referenced for its cogency and explanatory power. The author, now a senior professor at the University of Miami Law School, repeatedly calls on attorneys to understand the organizational context of their work. His book repeatedly calls out attorneys who ill serve their clients because they failed as organizational analysts. It has since been recognized by legal, ethical, and sociological theorists as a rich resource of corporate analysis and the divergent roles that lawyers play. The groundbreaking research was conducted at six major manufacturing companies as Rosen interviewed a triad of inside counsel, outside counsel and managers who worked on particular problems. This novel method allowed self-serving statements (especially by the lawyers involved) to be checked and placed in realistic context. More important, because it triangulated how the legal problem was understood, the method brought out how the legal task had been structured. The frames that the lawyers, managers and organization imposed on the legal problems varied widely—and the sources and consequences of these variations are detailed and explained. The book’s latest edition is now available from Quid Pro Books, but the manuscript has already had scholarly impact and praise. For example, the Yale Law Journal noted in 1996 that “Rosen’s important manuscript is widely cited in recent literature on legal professionalism.” It has been cited in articles in the law reviews of Boston University, Indiana-Bloomington, University of Maryland, and Emory, and the Law and Society Review. At bottom, researchers and pundits on corporate theory and lawyers’ roles have already had to account for this telling study, and at last they can readily reference it in a quality published format, in ebook and paperback editions. Rob Rosen’s study of in house counsel is a deft, subtle dissection of a complex world where nothing is as it quite seems. In interviewing in house counsel, outside counsel, and clients, Rosen captures, in a Rashomon-like way, the moral character of lawyers’ work–their choices, their pitches, their claims–by which they justify what they do. We see inside the professional black box. Why Do Lawyers Bill They Way They Do? Can Lawyers Use Data Well? How Have the Lawyers Escaped Culpability?